As an avid waterfowl hunter and a beginning deer hunter, I know how important dedication and patience is when it comes to any type of hunting. However being that I know my quacks better than my racks, I'd like to appeal to my fellow duck hunters.... Specifically when you've been in the duck blind waaaay too long. Duckhuntitis, commonly known as “DHI,” is an extremely contagious mental illness caused by an addiction to duck hunting or an introduction to duck hunting. Duckhuntitis appears most frequently during the winter and early teal season. The duckhuntitis virus attacks the brain by spreading through the left and right sides of the cerebrum. The duckhuntitis virus is spread from person to person through long hours of bonding in the duck blind while awaiting ducks to enter the hunting hole, typically by discussing one's family matters and politics and debating over changing the decoy spread. Duckhuntitis is contracted when one shoots his or her first duck. The virus then makes direct contact with the brain upon the host holding its first downed duck. There is no known way to limit the spread of duckhuntitis. Virus symptoms begin immediately after infection. Who's at greatest risk for duckhuntitis? While anyone can get duckhuntitis, teenagers, adult men and women are at the greatest risk for infection due to the thrilling nature of the activity that causes infection of the virus. Despite advances in duckhuntitis prevention and treatment the CDHHC (Center for Duck Hunter's Health Center) estimates that thousands of new people become infected each year. What are the symptoms of duckhuntitis? 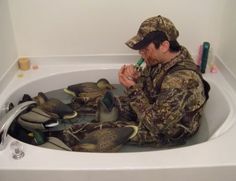 sleeping in is justified as 2:30 a.m.
What other illnesses may be associated with duckhuntitis? Duck Depression is an illness similar to duckhuntitis that may reflect a negative nature and more severe form of duckhuntitis. Most of the treatment options above do not relieve those with Duck Depression. For help with Duck Depression and illegal hunting thoughts please call the Duck Depression hotline at 1-DUQ-HNT-HELP, or contact the CDHHC (Center for Duck Hunter's Health Center) to report a case of diagnosed duckhuntitis.